Editor’s Note: This heartfelt story was submitted by Lynda Cheldelin Fell, the wife of one of our customers. The moment we read it, we knew it needed to be shared with the rest of our woodworking community! In 2009, our 15-year-old daughter, Aly, a competitive swimmer and straight-A student, was tragically killed in a car accident while returning home from a swim meet. Overcome with grief, my dear sweet husband, Jamie, buried his heartache. Managing commercial development projects, he escaped into 80-hour work weeks, more wine, more food, and less talking. His blood pressure shot up, his cholesterol went off the chart, and the perfect storm arrived on June 4, 2012. Just minutes after we returned home from town, Jamie began drooling. A strange look came over his face. I asked if he was okay, but no words came. He couldn’t answer. My soulmate and hero, my strong adorable, funny, brilliant partner in life, father of our children, and rock of my world was having a major stroke. At age 46, he was suddenly unable to speak, read, write, or walk. My world had come to a complete standstill. Jamie was hospitalized for 17 days. When he finally came home, we faced an uncertain future of outpatient physical, occupational, and speech therapies to help Jamie relearn activities of daily living. Our days became filled with appointment after appointment with catnaps in between. Little by little, Jamie’s hard work and determination paid off. He graduated from the wheelchair to a walker to a cane to solid footing. He relearned how to feed himself, bathe, pour a glass of water, and change his shirt. It’s been five years now since the devastating stroke that robbed us of so much. Although Jamie has regained mobility, his entire right side remains numb. The speech center in his brain, which was destroyed by the stroke, is permanently affected. But his mind remains keen, and his intelligence isn’t wasted. He keeps it active by puttering around in his workshop—a workshop that once sat neglected due to an overworked scheduled. Now with nothing but time on his hands, my dear sweet hubby turns his pain into passion by making beautiful one-of-a-kind gifts for family and friends. 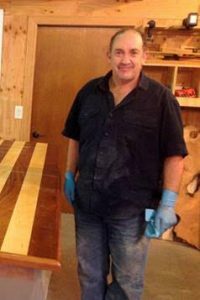 Slow moving and frequent rest periods prevent Jamie from making gifts as gainful employment, but delighting others with his woodworking brings joy to his day. A natural craftsman at heart, his attention to detail is unparalleled, and it’s evident that everything he creates with his hands comes right from his heart. 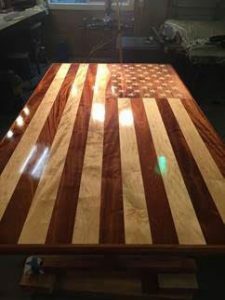 The American flag table below was a wedding gift to our niece. It took Jamie nearly a year, but his patience and determination produced a wedding gift unlike any other. A second American flag table is now underway for another newlywed niece. Through losing our daughter and Jamie’s devastating stroke, his workshop has become a symbol of our own personal silver lining: what once sat neglected due to an overworked schedule is now a source of pride and joy—and serves as a powerful reminder that obstacles are often opportunities in disguise. What a great inspiration to all of us. Beautiful workmanship from a beautiful soul. An inspirational and heart-warming story that brings hope to the heart. I’m wheelchair bound now, but still trying to do the things I enjoy. I can’t get out in the garden any longer, but I’m busy every day trying to “down size” the shop to wheelchair level; power tools at eye level are just too scary. At 66 I’m trying to retrain myself to use hand tools – so far it’s been a great source of humor. Thanks so much for sharing this wonderful (and victorious) story. I am encouraged! I am enthralled by Lynda’s heartfelt depictions of her husband. May we all be appreciated in such a soulful manner. The two of these parents survived the most wicked occurrence that can befall a family. Then came the time to start the healing process- in woodworking. Jaime’s struggle gave beauty, Lynda’s gave beauty. I am touched by such examples of love. A powerful story, which definitely inspires creative minds out there. Our prayers are with the family. From two tragedies. an artist.